What kind of houses are in Camden Woods Leawood Kansas? Homes in Camden Woods consist mostly 4+ bedrooms, with an occasional 5th, 6th or 7th bedroom, 3.0 to 5+ bathrooms, and the vast majority of the homes have 3 or more car garages. Camden Woods provides a wide variety of floorplans such as the traditional two story, ranch, reverse 1.5 story, 1.5 story or master down layouts. The homesites (lots) in Camden Woods average roughly 1/3 acre in size with some larger and some smaller. Camden Woods features a pool. 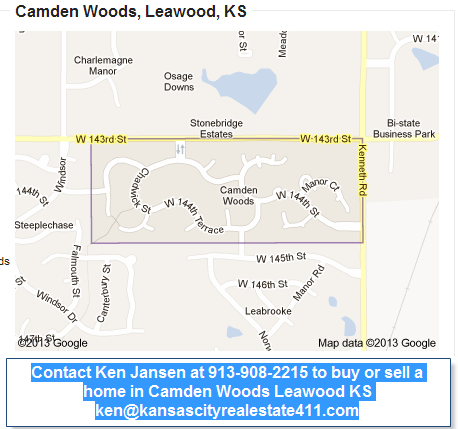 Camden Woods is located South of 143rd Street and West of Kenneth Road in Leawood Kansas 66224 Johnson County Kansas. 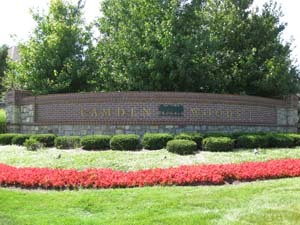 Camden Woods is just minutes from Prairie Fire, Leawood Town Center, One Nineteen Plaza, Hawthorne Plaza, etc. Camden Woods is filled with quiet cul-de-sacs and landscaped boulevards.